Wire core construction steel rope is one of our specialities here at Rope Services Direct. We supply and manufacture only the highest, premium quality 7×7 wire core galvanized steel rope available on the market ensuring you complete satisfaction and a long lasting product. 7×7 wire core galvanized steel rope construction (WSC) is made up of 7 main strands, of which each strand is made up of 7 smaller strands. The rope has moderate flexibility and a high resistance to corrosion making it ideally suited to marine conditions. It is a general-purpose rope and can be used for a wide range of different applications. Due to its limited flexibility 7×7 wire is ideally suited for use on a pulley or winch system. It is quite often purchased in smaller diameters so as to ensure maximum flexibility. When purchased in small diameters like this, it is known in the industry as aircraft cable. This can be quite confusing for some people as its intended use is not in fact for aircraft at all but industrial and marine applications. Wire core construction rope differs from fibre core construction rope as it is generally less flexible, however it is much more hard wearing making it more suitable for applications such as guy wires, guard rails and suspension cables. 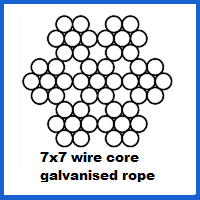 To go ahead and order your 7×7 wire core galvanized rope please fill out a rapid enquiry form here. For further information on this rope or indeed any of our wire rope sold here at Rope Services Direct, please call us on 01384 78004. 7x7 Wire Core Galvanized Steel Rope Overall rating: 5 out of 5 based on 6 reviews.